Leg day. You either love it or you hate it. For many, the dread of the next day’s DOMS can lead to carrying out the same leg routine week in and week out. When it comes to building leg strength and fending off injuries, nothing comes close to the squat. Leg strength is the foundation for most other exercises, “[squats] build functional strength through the legs and hips, develop proper range of motion in the ankles, and shore up muscle imbalances to prevent the risk of injury.” explains Janet Hamilton, C.S.C.S., an exercise physiologist. However, no two squat variations are the same, and each variation targets different muscles, movement patterns and/or skills. I will assume you can already do a bodyweight squat and perhaps the standard barbell back squat. If not, check out our post on How to Squat: Proper Barbell Squat Technique. The following 5 squat variations are not in any particular order, and I am not recommending you squeeze them all into one workout. To build explosive power and add an element of plyometric movement into your leg workout, the jump squat is the perfect exercise. The idea is to generate a lot of force in a small amount of time. Great for building running and jumping power. Stand upright with your legs about hip width apart facing the box (start with the lowest weight). Bend your knees and lower into the low position of a squat, where your thighs are about parallel with the ground. Move your arms behind you, ready to jump. Explosively jump up and forward onto the box, swinging your arms to give you momentum. Land softly on the box and lower down into the bottom of the squat position again. Stand tall on top of the box before dismounting carefully by stepping down. Do between 3-4 sets of about 6-8 jumps. Once you’ve mastered this, jump onto a higher box. The higher the box, the more power and strength will be needed. If the smallest box is still too high to begin with, simply jump as high as you can directly up. Once you are confident with your jump, move onto a box. This squat variation is less about strength, and more about technique, incorporating balance, mobility and control all into one movement. It will help greatly towards improving your general squat strength simply by helping with your technique. Stand upright with your legs hip shoulder apart. The grip on the bar should be wider than your shoulders. Keeping the bar held above your head, slowly lower like a normal squat. Rise slowly back to standing position. Do around 3-4 sets of 8-10 reps. Use a light barbell without weights or even wooden bar to begin with. Once you can manage the full range of movement with low weight, you can slowly start increasing the weight. Remember, Olympic barbells weight 20kgs. Once you’ve mastered the bodyweight squat and have a good amount of strength in your legs, next up is the single leg squat, AKA the pistol squat, named as such because of the way it looks in the bottom position. This is a great exercise to do in your own home, as you don’t need any weight to get a leg good workout. It’s a particularly good exercise to build up the max strength of each leg, and can help correct any muscle and strength imbalances. In fact, if you’ve never done a pistol squat before, you’ll quickly notice which leg is weaker, and it’ll likely be very obvious. Stand upright with your legs together. Extend one of your legs directly out front. Slowly lower by bending your planted leg at the knee, keeping your body upright and chest over your planted foot. As you lower, lift your extended leg until it’s more or less parallel to the floor. Lower as far as your ankle will allow or you feel your leg is about to give way and hold for a brief moment. Push back up to the high position. You can make it a little easier by using a chair. Go from standing to sitting back in the chair, using one leg, under control. Do this until you build up some strength and have the movement perfected. Do about 2-3 sets of 4-6 reps on each leg to begin with, and either add weight by holding a kettle bell near your chest, or simply increase the number of reps to build up more strength. Another single leg squat variation. 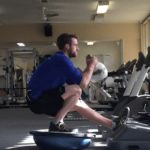 This one is a must for anyone, especially runners or sportspeople, as it specifically targets the gluteus medius more than most other squat variations. The gluteus medius is a stabilising muscle, which if left untrained and weak can often the be the cause of knee and ITB (Iliotibial Band) issues. Start in a standing position with a bench behind you. Place your rear leg on the bench. Lower your body slowly and under control by bending your knee and hinging at the hip, keeping your torso vertical. When your active leg’s thigh is parallel to the ground, pause and then push up using only your active leg. The rear leg should have most of the weight off it, and is only there for balance and stabilising. Carry out around 3-4 sets of 8-10 reps on each leg. To increase the difficulty, you can add weight by holding dumbbells by your side, as seen in the image, or by increasing the number of reps.
By holding the barbell across the front of the shoulders rather than on the back, you encourage a more quad dominant squat movement, therefore this is a great way to build the strength in your quadriceps. Stand upright with the barbell resting on a squat rack touching the front of the shoulders. Grip the bar with the palms of your hands facing away from you and slightly upwards. Not facing towards you. Stand, lifting the barbell with it resting across the front of your shoulders and take a step back. Lower, under control, as far as you can whilst maintaining balance. You might feel like you’re leaning back more than you do with a normal squat, this is normal. When you get to your lowest point, pause, and then slowly come back to the starting position. After your reps, walk forward and place the weight back onto the rack, making sure both side are safely on before stepping away. Do around 3-4 sets of 8-10 reps. To begin, and to master the technique, start with just the bar. As you feel more confident about the movement, begin to add weight. You should find that you can’t lift as heavy as you might with eh back squat in this position, so don’t try to lift the same weight.